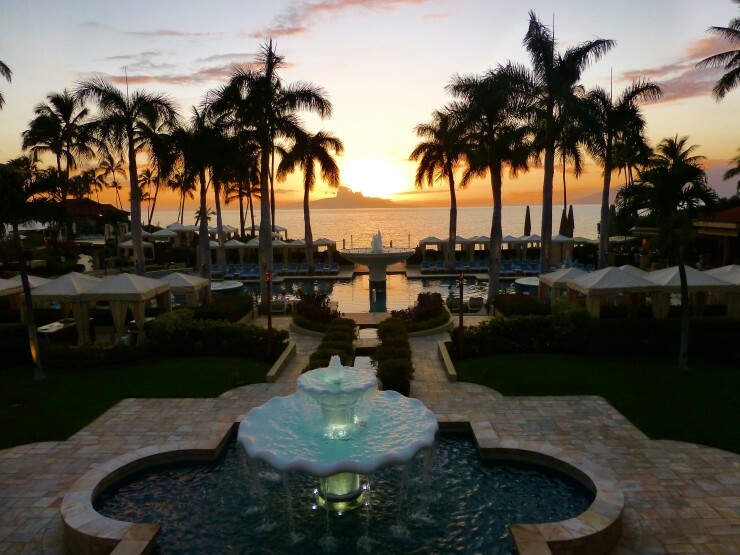 I’ve been fortunate to stay at some pretty spectacular hotels and resorts thanks to my job, and let me tell you — the Four Seasons Resort Maui at Wailea is hands down one of the best hotels I have ever stayed at. 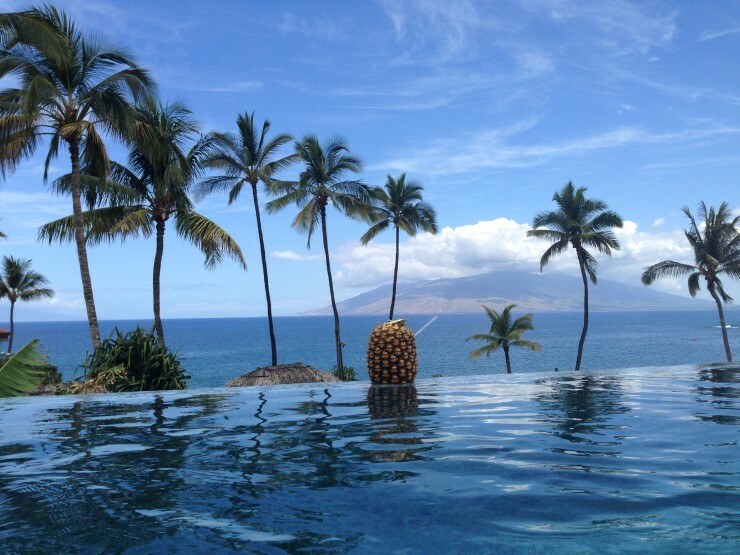 Infinity Pool at Four Seasons Maui. 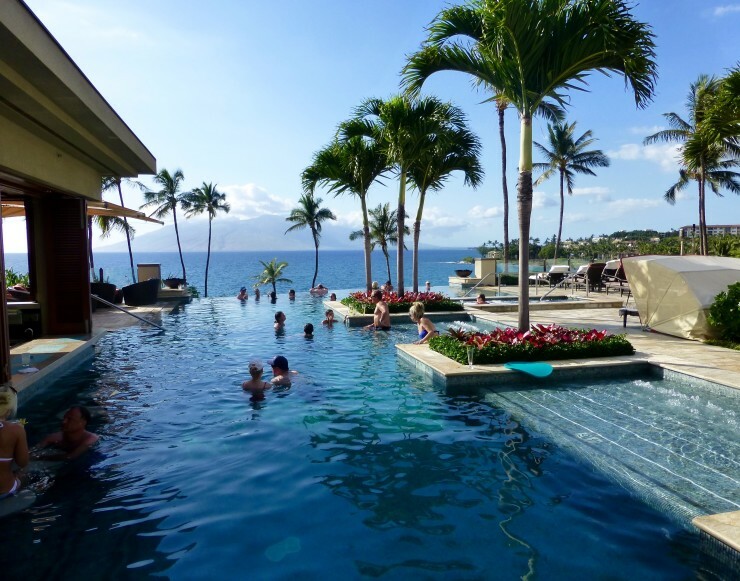 The infinity pool at Four Seasons Maui at Wailea not only has an insane ocean view thanks to its elevated position, it also has a fun swim-up bar and plays music underwater. I’m not kidding. Float in the water with your ears under the surface and you’ll hear relaxing melodies drifting from the underwater surround system. There is also a swim-up bar. Mai Tai for Tom and awesome fruit smoothie for me at the swim-up bar. This adult-only pool is stylish too. You can reserve (for a fee) Serenity cabanas by the pool for the day that have furniture in them designed by Missoni Home. 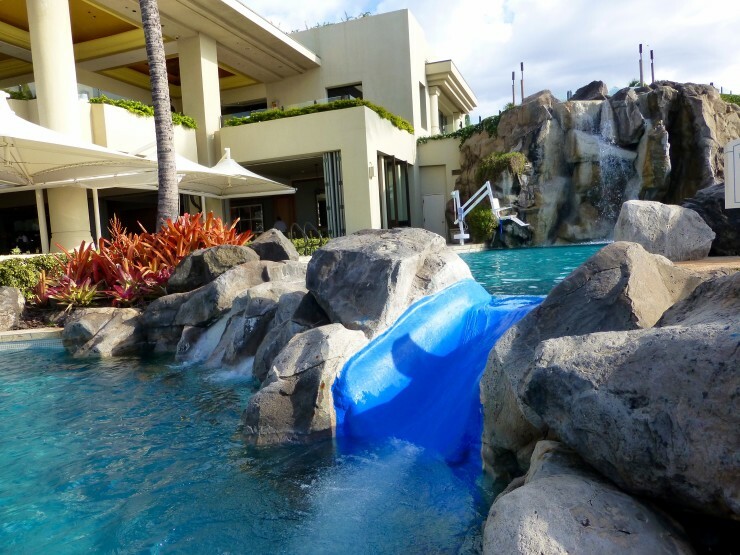 The Four Seasons Maui adult pool doesn’t mess around. It may very well be the best pool in Maui — or all of Hawaii for that matter. Tom and I did manage to tear ourselves away from the adult pool in order to check out the rest of the resort. There’s another pool that isn’t age restricted and which has free cabanas to use. The main pool at the Four Seasons Maui. This all-ages pool is also adjacent to the best kid pool I’ve ever seen. Two-tiered kids pool with a slide. Speaking of children, the Four Seasons may seem like a place that wouldn’t be family friendly but it actually caters to children quite a bit and is great for families. 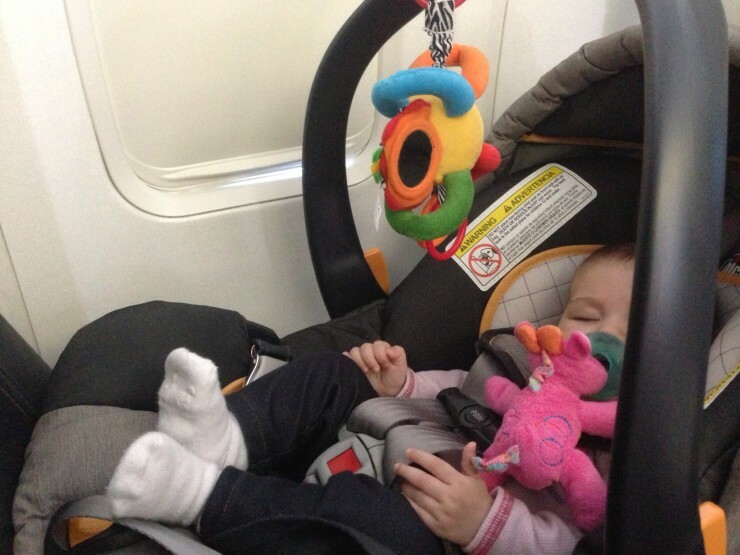 There is a free kids club and nannies can be booked for you through the concierge. There are also special kids nights at the restaurants and a video game room. Each night during the lighting ceremony, kids are also more than welcome to follow the torch bearer around as he makes his rounds lighting each tiki torch. The torch carrier making his rounds with kids in tow. Beyond the pools, the Four Seasons also has a sloping hill with lounge chairs set up, some of which offer quite a bit of privacy while still being in close proximity to the ocean. The beach is at the bottom of this hill. The relaxing beach in front of the Four Seasons. Tom and I also loved the beach by the Four Seasons. 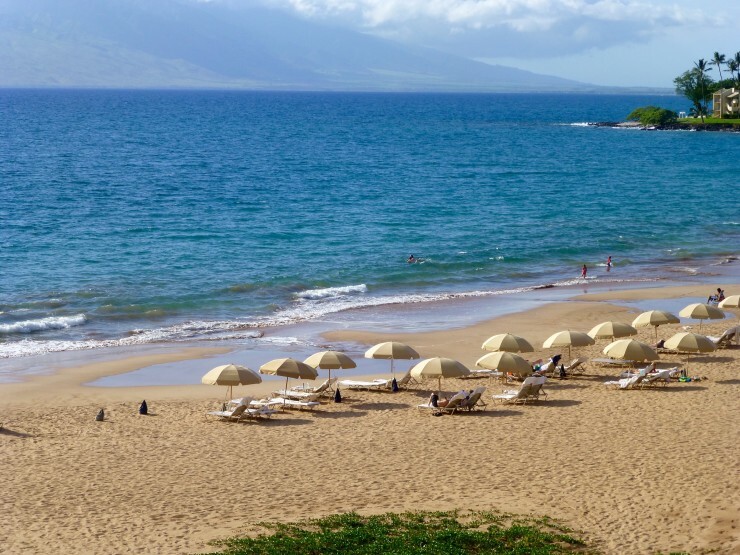 All beaches in Hawaii are public, but Four Seasons Resort Maui still goes above and beyond by carrying beach chair loungers down for you so you can sit in close proximity to the surf and removing them from the sand when you’re done. Now that is service. There are also a variety of beach rentals like surfing and stand up paddleboarding, plus you can rent an hour of free snorkel equipment to use. Need some pampering? 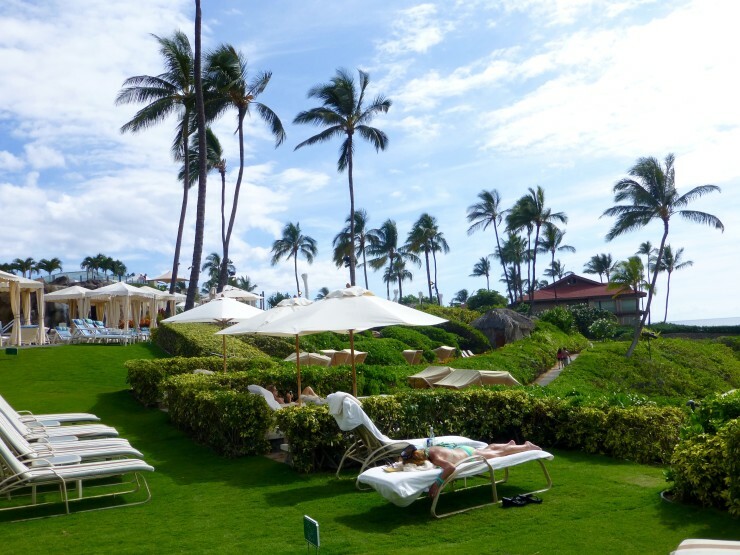 There are Hawaiian halays for beachside massages. Tom and I unfortunately didn’t have time to do this. 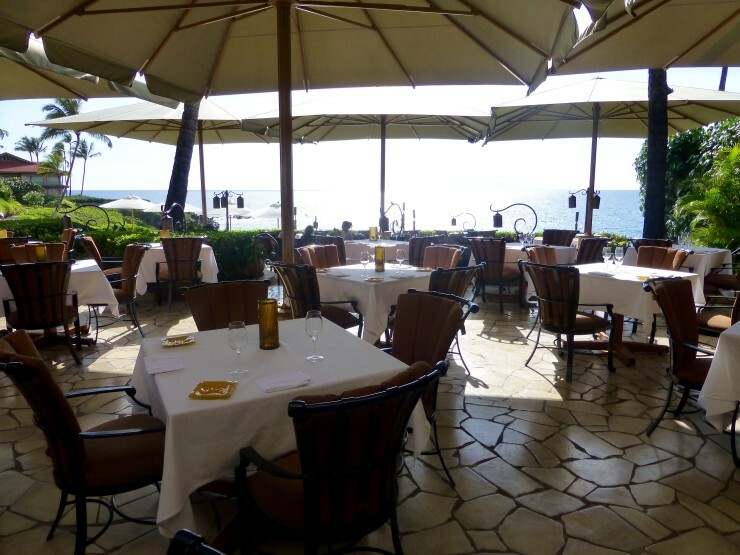 The beachfront restaurant at Four Seasons Maui. At the Four Seasons Maui breakfast buffet, there was a table of breads and muffins. And a table of fruit. And one for meats. Plus, an omelet station with a plethora of filling choices and which produced fluffy, perfectly cooked and well-sized omelettes. For an extra charge (of course) there was also a smoothie station. 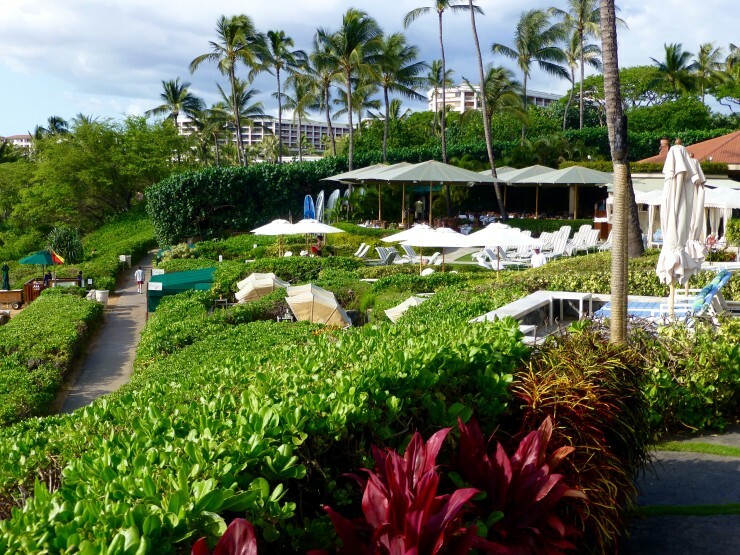 For lunch and dinner, Four Seasons Maui has an array of onsite options. You can dine at Ferraro’s on wood stove cooked pizza or go to Spago’s for some regional cuisine. We opted to eat at DUO, since they were having a farm to table themed dinner the night we were at the resort. It was a wise choice. We got to select our cut of meat at DUO. 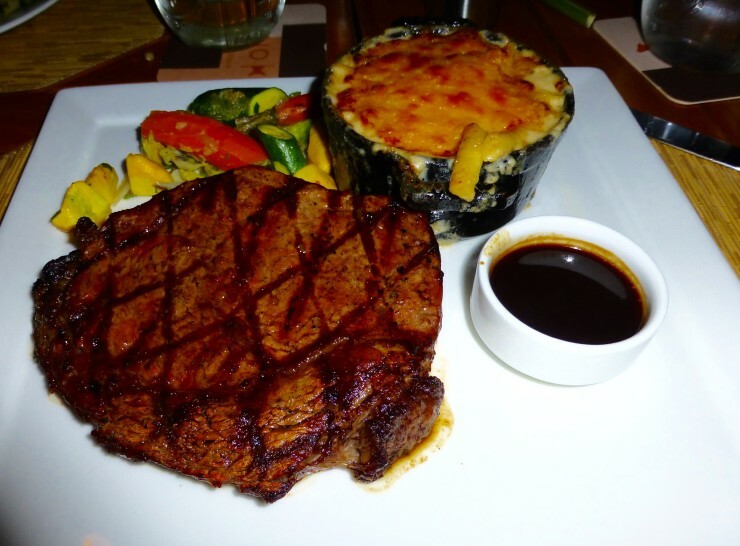 And then eat the meat with a couple delicious sides. Not only was the food amazing at DUO, the service was also impeccable. Our server, Beau, was so friendly and nice and smiley that Tom and I actually started to doubt if it was all for show. I mean, normally you assume servers are nice to you because it’s their job and they want tips. But Beau had us wondering — maybe he really was that nice and happy to be there waiting on us so pleasantly? But no, I’m sure that’s just the caliber of employees a place like Four Seasons Maui gets. (Ok, and I’m sure he is a genuinely nice person, but the level of service went above and beyond expectations). I barely wanted to spend anytime in our room due to the above reasons, namely the pool and beach, but when we were in it, the room was modern, comfortable, clean, and had a great view. The bathroom was also marvelously massive. 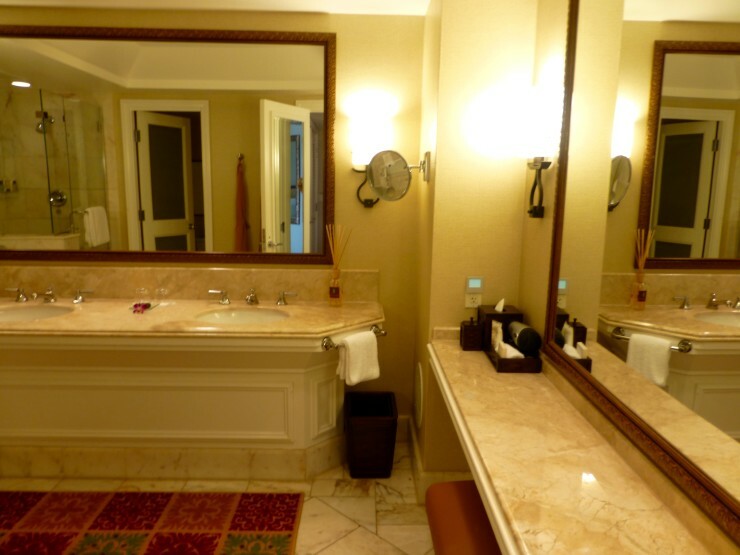 Separate tub and shower at Maui Four Seasons. I loved the huge vanity. Better shot of the room’s view. 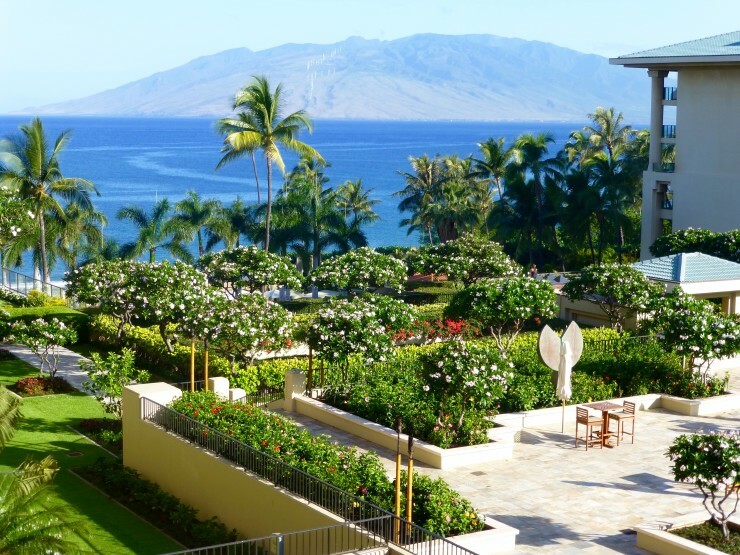 The Four Seasons Resort Maui at Wailea is a total splurge. It’s where celebrities and stockbrokers vacation. 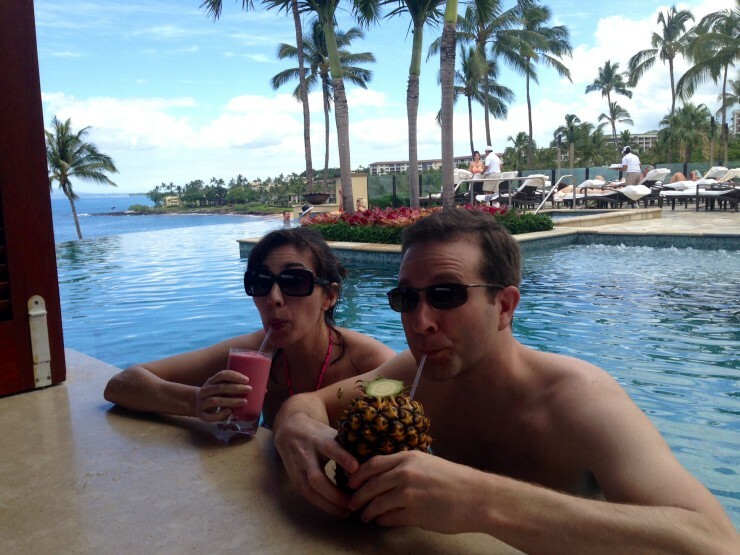 Us normal folk who are there are probably there because it’s a once in a lifetime honeymoon, Maui babymoon, or anniversary trip (and oh my gosh, go on your honeymoon there, you’ll love it) or — in Tom’s and my case — you have a job that means getting to experience such a spectacular place. I reached out to Maui Four Seasons after winning a trip at a Maui press junction in San Diego. Though Four Seasons wasn’t part of the prize package, we were offered a couple nights to check it out. Wearing my bracelet from the Four Seasons while at a Luau in Maui. If you can’t afford the splurge, you can still lounge on the beach at the Four Seasons (remember — all beaches in Maui in public) or enjoy the property while taking the self-guided iPod art tour — even if you’re not a guest of the resort’s, you can check out an iPad at the front desk and do a self-guided tour of the property’s art collection, much of which is inspired by Hawaii. 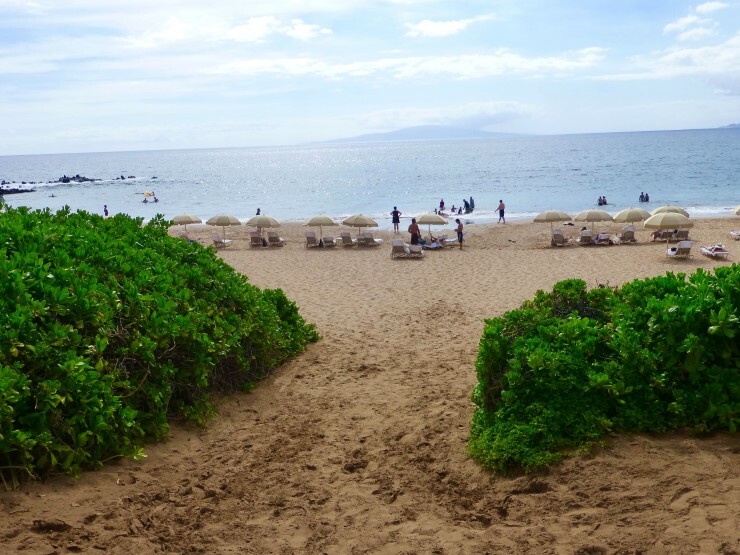 Note: My stay was hosted by Four Season Maui at Wailea, but — as always — all opinions are completely my own.